My daughter has a newfound love for fudge. She is a very healthy eater overall – she eats loads of fruits, is not afraid of green food and is very active, and so I decided to indulge her. But things didn’t go smoothly at first. I burned two batches. Yes, I can be incredibly impatient. I admit it. At one point, my husband took over and helped stir. I thought that would help but alas, we stirred at the wrong time and end up with SAND. Seriously, we made flavored sand. Now, I always thought that I was a pretty experienced cook, but truth be told, I do not have much experience making candy with the exception of this candy. But that didn’t really count because my daughter had just learned to make the perfect cashew brittle at candy camp…and so we had a bit of an advantage. After making fudge a few times, I can now say that I feel confident. For me, the keys were finding a temperature “sweet spot” where the fudge simmered gently so to avoid burning and it also really helped to find a recipe that includes corn syrup, which may sound like a bad idea, but in this situation it is not. 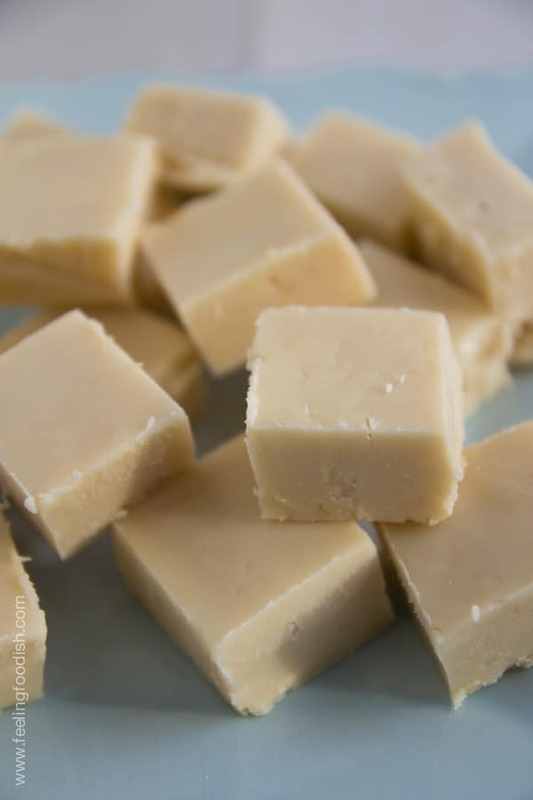 The use of corn syrup prevents crystallization of the sugar, giving you a nice and smooth fudge. A candy thermometer is needed for this recipe. Read more tips about making fudge over at AllRecipes. Fudge typically makes me think of the NJ Boardwalk during the summer time but one look out of the front window and I’m back to reality! 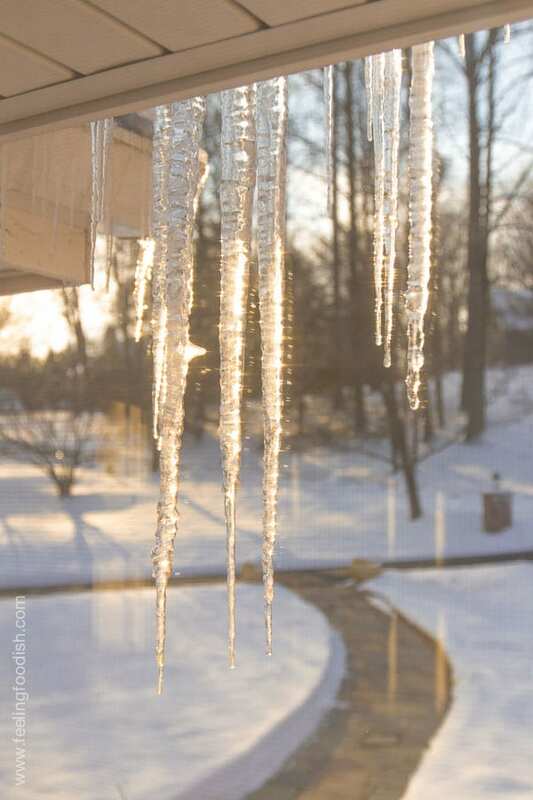 Spring, spring, please get here quickly!! In a large heavy-bottom pot, add sugar, heavy cream, corn syrup, and salt. Raise heat until the mixture reaches a very gentle simmer and insert a candy thermometer. Continue to heat without stirring until the mixture reaches 238F, the soft ball stage. While the mixture is cooking, wash down the side of the pot to prevent crystallization. When the mixture reaches the target temperature, immediately transfer the contents to the heatproof bowl containing the butter and vanilla. Do not scrape sides or bottom of pot. Allow the mixture to cool undisturbed until it reaches 110F - do NOT stir. Immediately transfer to prepared pan, smooth top with spatula or back of a spoon, and let it rest on the counter for at least another hour before refrigerating. Refrigerate for at least 8 hours or until set, remove paper or foil, and cut into 64 square pieces. Wow what a bunch of jerks on here. First off She didn’t take anyone’s recipe. This recipe is older than all of us put together. Martha Stewart is great but she takes a lot of old recipes and renews them. So JC, Charles, Mike and anyone else on here who has bashing to do, get lost because we really don’t want you on here. The lady was nice enough to post this and correctly at that. Every recipe comes from long long ago. Just like music. You just recreate it. I’ve made this many times and have had great success. Looking to see if anyone has tried to add chocolate? I followed the recipe exactly and my fudge never hardened. I am so disappointed! Did anyone else have this problem? I stirred for a good 15 min after it cooled to 110 degrees and it thickened a bit but I figured it would harden more after it sat and then was in the fridge. But it was still so soft I couldn’t even cut it. Tasted yummy, but couldn’t use it. so the most common reason for not hardening is the fudge was cooked to the target temperature. There are ways to save it if it’s not too late? Unfortunately I already threw it away! I used some of it for icing because it was so soft, but the rest I didn’t think was savable. Please tell me how I could have saved it for future reference! Thank you! Followed instructions to a “T” and I’m 99% sure it carmelized. Very low simmer and it started to darken long before soft ball stage. It’s cooling now. This is Martha Stewart’s recipe. You should credit her. Yup, agreed – she’s been credited. Maybe you missed it? Well, thanks for your note Charles…yes, I did provide a link to the original recipe as you may have noticed. I do try to update things a bit, provide my insight, or/and explain things a bit better whenever needed, which I believe was the case here. Hope that helps to clarify! Don’t let the Negative Nellies (or Nelsons) bother you. I’ve seen the same or very similar recipes in books as old or maybe even older than MS. I’m reasonably certain SHE got her recipe from somewhere or someone who had made it long before she did. I haven’t tried making fudge yet but my mother in-law and I are very excited to try it. I just have one question. What do you mean by “wash down the side of the pot” wile it is on the stove? The texture was fine, however I and everyone who tried it found it painfully sweet. Hmmm, I’ve never had fudge that wasn’t painfully sweet. As I understand it, the sugar to milk ratio is important to the success of the recipe. Perhaps adding nuts or chocolate flavor would cut down on the sweetness? Hello! I made your delicious fudge. However it did turn out very grainy. Is that because I didn’t let it cool to 110 before stirring vigorously? It was at about 140. Also I was too afraid to not stir when I was waiting for it to get to 238. Could this have caused the graininess? Just wanting to learn from my mistakes. Hi Chelsey – can I think stirring could have caused crystallization leading to graininess. It seems like a lot of things can lead to that but the addition of corn syrup is supposed to help. Read the answer on this link and maybe that will help too. Yes, that was a very helpful post. Thank you so much! I would definitely say it was my stirring when I was bringing it to a boil. Wish me luck! By the way, despite the graininess, it’s delicious! Can this recipe left out at room temperature, or stored in the refrigerator? How long does it keep? Hi Jake – it should be refrigerated (can be for held for up to one week) and then brought to room temperature before serving. Thanks, looking for a good fudge base that can be left in an air tight container at room temp. With a long shelf life, Know where I can look? 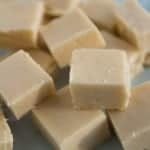 I’m not a fudge expert but rather just wanted to share the recipe that finally worked for me. I believe longer term storage at room temperature would involve the use of some kind of preservatives, which I tend to stay away from. There was a member only site that I came across, which required subscription, but seemed like it would provide this kind of information. If you are interested, I can pass along the site URL. It will grow mold if left at room temp. I learned the hard way. My while family loved this fudge. It tastes as good as boardwalk candy store fudge. Thanks so much for sharing! Fantastic recipe! This was my first time making fudge and I had people asking for the recipe all night. Thanks Marie! Once I learned to make homemade fudge I was hooked, never buy the store packed stuff … it just doesn’t compare. 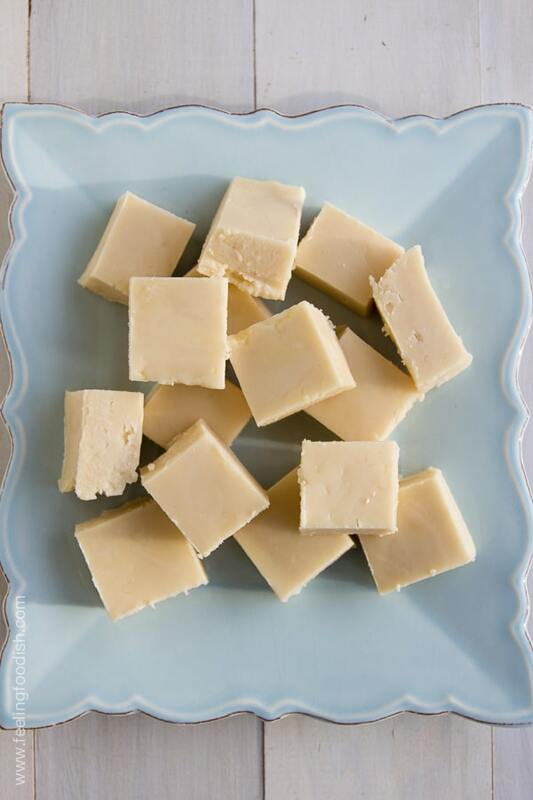 Using corn syrup is a great tip to prevent sugar crystals and make a creamy fudge. I have seen some recipes use sweetened condensed milk which works too but it changes the flavor and seems less authentic to me. Interesting! Thanks for sharing your tip on condensed milk. My daughter wanted to try a recipe with condensed milk (maybe that was try number 2?) and I think the heat was too high. Burned mess! LOL. I now know better – patience is key with candy making! I would sub it but have not personally tried it. If you do, let us know how it works. These photos make me want to buy new (larger) pants! Oh, I agree – same here, Maureen!